Pod Taxi, an aerial travel option which is being used in London will soon be available at Trivandrum, reports Kerala Kaumudi. As per the reports, the London model Pod Taxi project which moves around elevated poles near footpaths is on the approval of the Central Government. 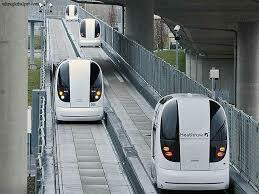 The Pod taxi route is expected to be operational at East Fort - Thampanoor - Vellayambalam - Thampaboor - Kazhakoottam - Technopark circuit. Metroman E Sreedharan has been consulted as technical expert for the project.